It’s been a while since I wrote about a family day out. The weekly trips have still been happening but with birthdays, half term and awful weather they have been a little more low key than normal. After another week of rubbish weather and not being able to go to the fireworks on Friday because of the stormy conditions we decided that we needed to do something exciting this Sunday. Regardless of the weather, we needed something to refresh, invigorate and energise ourselves. We chose to go to a country park, not our nearest at over 25 miles away but one with some amazing activities to do in the woods. As Little Man has been making brilliant progress riding his bike independently we wanted to be able to take the bikes over and let the little ones ride safely on friendly cycle paths. There was the option today to hire bikes too and we did consider this but felt that we needed to be there to steady Little Man on his starts etc.. However given the success I would love to hire a bike and do a family ride next time. We had several stop offs on our route to have a go on some stunning play equipment all made out of natural resources, its amazing how it just blends in with the environment. After the ride it was time to return the bikes to the car, enjoy a cheeky cup of coffee and walk around. We went to watch the High Ropes section and again are hoping to have a go on our next visit, both children were adamant that they would be able to do the ropes and I definitely fancied a go too. There is also a miniature train so we had a go on this before our picnic lunch and more pottering around the forest. 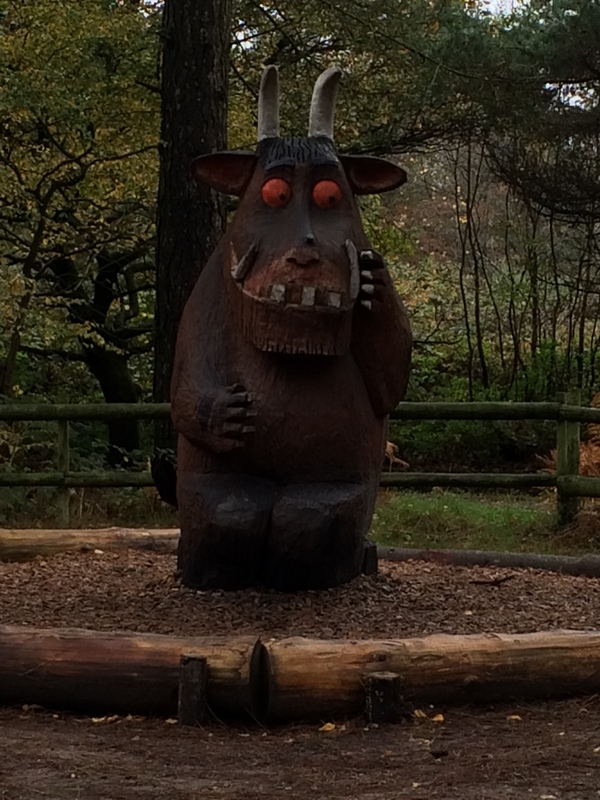 On our walk we found a very important character, the Gruffalo! Now for many years we have played a little game hunting for a Gruffalo on our forest walks, there have been occasional glimpses, little Gruffalo sounds etc.. so I was made up to finally find one. I love the Gruffalo and the park was the perfect setting to find him, I held his hand and gave him a little tickle behind the ears. I’m sure I heard him giggle and the children agreed with me too! Needless to say there were lots of family photos taken with my literary hero. It was such a good day, the weather was typically autumnal with only a few brief showers but we were appropriately dressed and able to do all we wanted to. We returned home, happy, muddy and all refreshed after a day outside exploring and playing, a lovely family day.